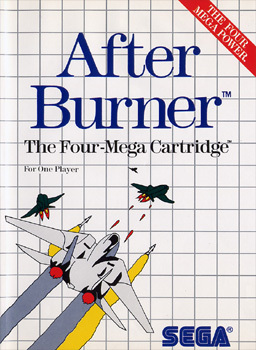 Being one of the most widely distributed games, After Burner has several different cover variations. The major differences are between the US/Brazil, PAL, and Japanese versions. The JAP version is much more elaborate, based on the original artwork. The US and Brazilian versions have the same basic design as the PAL versions (an F-14 flying at an angle), but much more detailed. The PAL version exists in several forms with minor differences. The artwork is more stripped-down and basic. Sega's arcade smash hit comes to life...on your Sega System! You're a Navy Air Captain. At your control is the most advanced fighting jet to ever set the skies on fire! You supply the skill, reflexes and guts. Your F-14 Thundercat gives you Mach 2+ speeds, unlimited firepower and state-of-the-art battle computer which targets your enemies for destruction. Fire guided missles, then blast away with your Vulcan cannon. Roll your F-14 left and right! Enemy missles slide under your wings. Your afterburners roar as you dive for the wave tops! In this sky battle you're outnumbered. But that's O.K. When it comes to flying the unfriendly skies, you're the one they call "The Ace." Simply hold your plane in either of the corners, and no weapons can hit you until later in the game. Here are three different continue codes. 1) Press up on the Directional Pad as well as Buttons 1 and 2 to continue. This can be used twice throughout the game. 2) After you die, at the title screen, press the Pause button on the Power Base 100 times (yes, you read that right) to continue. This can only be used up through level 17.